Acquired: Signed as a free agent Mar. 16,2017. Re-signed on Feb. 13, 2018. 2018: Adams finished the season on the six-game injured list. 2017: In 15 games (15 starts), Adams finished with 65 total tackles and two interceptions. In the West Semi-Final, Adams recorded four tackles. In the West Final, Adams recorded five defensive tackles. 2016: (Hamilton) Adams finished 2016 in Hamilton where he recorded 19 tackles in four games. 2016: (Winnipeg) Adams played in five games for the Blue Bombers where he recorded 21 tackles, five special teams tackles, and an interception. 2015: (Winnipeg) Signed as a free agent in 2015, Adams played in 18 games for Winnipeg where he recorded 64 tackles and six interceptions returning one for a touchdown. Pro: In 2013, Adams spent time with the NFL’s Houston Texans , Buffalo Bills and Oakland Raiders. 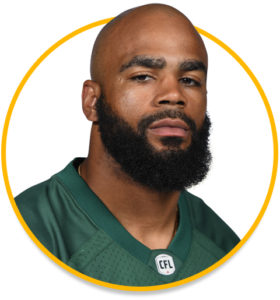 College: A Michigan State alumnus, Adams started in 39 of 54 games where he recorded 157 tackles, 35 passes defended and 11 interceptions. Adams was named an All-Big Ten all-star three times, two first team and one second team.